A powerful marketing strategy is often the key differentiator when it comes to small businesses making a post-launch impact and enjoying sustained growth and success. In today's information-rich digital era, consumers are constantly bombarded with marketing messages from businesses and brands on every front – television, radio, online, in-store and, more than ever, via social media. Discerning what is relevant and what is just 'noise' can be difficult. So, what can you do to grow your business with marketing? The changing face of marketing and the ongoing disruption to its practice and channels means small businesses must be actively developing, revisiting and updating their marketing strategies to remain ahead in a highly competitive environment. The term 'marketing' – used to describe the commercial activity of buying and selling products or services – came into popular use in the late nineteenth century. The landscape has changed dramatically since then, however many of the philosophies we know today originated in techniques and developments from the past. Generally speaking, marketing is known as having evolved through six key eras: the trade era, the production orientation era, the sales orientation era, the marketing orientation era, the relationship marketing era and finally – the era we find ourselves in today - the social marketing era. This current era has been heavily influenced by digital disruption which has led to a need for social interaction and a real-time connection with customers. Businesses are now connected to current and potential customers 24/7, so engagement is a critical success factor. In this environment, a key challenge for small businesses is to stand out from the crowd and deliver your 'story' in a way that attracts attention, speaks meaningfully to your target audience, develops trust and ultimately creates sales and customer loyalty. Right now, leading marketers focus on the importance of what is known as an 'audience-first' strategy. This approach involves creating marketing strategies for your small business that deliver content your audience wants from you, and not what you want to create as a business. At the heart of audience-first marketing is the delivery of the right message, to the right audience, at the right time and using the right channel to make a connection. 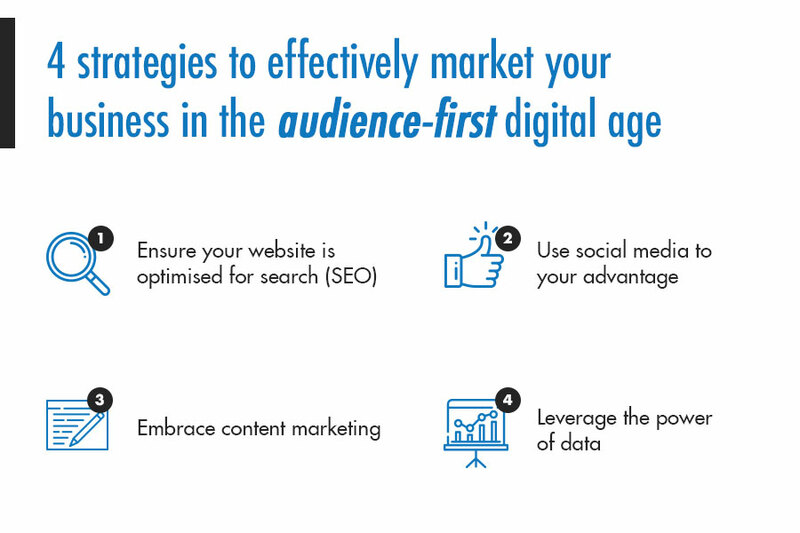 To succeed using this strategy, small business owners and operators must research and identify where their target audience 'hangs out' online and then engage them with relevant information and content. This approach represents a massive shift over the last ten years. Creating a “look at me" marketing approach is no longer relevant. Audiences are smarter and far more discerning in how they consume and interact with messages. Irrespective of the industry or sector in which your business operates, the expectation among consumers is that you will be easily discoverable online. Ninety-three per cent of Australians use the internet every day, and most start their search for products and services online. Considering this, search engine optimisation (SEO) is vitally important when creating and updating content on your website. If you're new to the concept of SEO, check out the government's helpful advice on improving your search ranking. Google's free SEO Starter Guide is another excellent resource. If you've had your business website created by a professional developer, they should have optimised your site for SEO during the build. If not, even the free website builders used by countless Australian small businesses (such as Wix, Shopify or Squarespace) include simple, easy-to-use SEO tools to ensure search engines like Google can find your website and present it to users in search results. Factors such as URL structure, meta descriptions (and other content tags), page load time and content relevance all impact SEO and help search engines rank your website against your competitors. Keywords are also important for SEO. Keywords are the terms potential customers are likely to use when searching for your products or services online, and as the specialist SEO marketers at Moz explain, "You want the keywords on your page to be relevant to what people are searching for, so they have a better chance of finding your content among the results." You can start by researching the keywords your customers are using to find your products or services by using Google's free keyword planner tool. With 17 million active Australian users on Facebook alone, it’s easy to see why social media has become an essential element of the modern marketing mix. Thankfully, channels such as Facebook, Instagram and Snapchat have already done all the hard work – capturing the key demographics, interests and behaviours of millions of users. As a small business, you only need to tap into the relevant categorisation to cost-effectively market your services and products to your key audiences, which can be as broad or as niche as you require. Social media sites make it simple for small businesses to advertise and promote their products and services. Start with the launch of a business or product page (using Facebook Business for example). Complete your page with as much detail as possible, then implement a three-month calendar of sponsored posts using different types of content. Consider offering incentives or giveaways to both grow your social following and increase exposure to new audiences. Email – it’s hard to overlook the power of Email Direct Marketing (eDM) to engage with customers directly. There are lots of ways you can grow your email list, many of which are simple to implement. Free or inexpensive software such as Mail Chimp makes email marketing and automation accessible for businesses of all sizes. Video – video engagement is on the rise, and a convincing 72 per cent of consumers say they would rather engage with video, over text, to learn about a product or service. Think iPhone and iMovie to get you started. Content in pay-per-click advertising – services such as Google Ads allow small businesses to present themselves to active online searchers for an affordable fee (you set your budget). Make sure the content of your ads hits the mark by again using well-researched keywords. One of the by-products of the information age is unparalleled access to data. From consumer insights to a buyer’s path to purchase, marketers now know more than ever about the decisions their customers make – and how to influence them. Known as data-driven marketing, even the smallest of businesses can use data to inform their marketing decisions. Google Analytics – Google’s free digital analytics platform – is a great place to start. Use it to track visitors to your website and learn which pages they view, then use this data to inform the way you present your products or services online. Likewise with data from your social media campaigns – Facebook and Instagram 'insights' allow you to see which campaigns are gaining the most customer traction, and which ones you can reassess, tweak or delete. To succeed in marketing your small business in today's digital environment, you’ll need a firm handle on the current marketing landscape, including both challenges and trends. An MBA from Victoria University (VU) will give you the skills to evaluate contemporary marketing practices and to achieve your small business objectives through digital marketing. Find out more about Victoria University’s (VU) online postgraduate courses. Get in touch with our Enrolment team on 1300 043 531.